Interview with Jeff Arnold, a man who works 230 days of the year on a US military base in Kandahar, Afghanistan, and spends the rest of the year travelling the world. Jeff Arnold works as an Operations Data Analyst for a major military contractor in Kandahar, Afghanistan, collecting statistics from all departments on base. Everything from the number of meals served to the gallons of fuel pumped. He’s been doing this for six and a half years. Buffalo Milk met Jeff, in a quaint little restaurant in Udaipur, India in the summer of 2011. Remembering his unique living arrangement we asked him to share his story for our ‘home’ issue. “I work for a company that was hired to maintain US military bases in Afghanistan. The company I work for feeds and houses the troops and supplies general maintenance for the base. The concept behind this is that they have civilians doing the work that military personnel would usually do, thus freeing up soldiers for combat. Contractors work 12-hour days, seven days a week, and have rooms that are only four meters squared (military policy). I live in a wooden hut divided into four rooms, which is nice considering most personnel on base live in large 10 man tents that offer no privacy. My base is located just outside of Kandahar city and is surrounded by blast proof walls 4.5 meters high. You cannot enter the base without proper authorization and would be shot if you attempted. Blast walls surround everything on base, there are no trees, grass or paved roads and everything is tan dirt, the fine dust permeates everything and nothing can be heard over the drone of large commercial generators running 24/7 (electricity supply). We cannot leave the base or go outside “the wire” as it’s called. If we were to go outside the base we would most likely be kidnapped soon after. Everyone is issued ‘personal protective equipment’, including a bullet proof vest and helmet which we are required to wear on helicopters and while travelling in armored vehicles. Mostly days are quiet and uneventful, for the most part … however insurgents constantly launch rocket propelled grenades and mortars onto base whenever they can in hopes of killing people. Those are times when all hell can break loose. It’s difficult to describe the first time you experience an explosion near you. We have training for how to react to indirect fire attacks but all that goes out the window when the explosions start and fear rules the day. I have been through so many (unfortunately), I won’t even get out of bed to go to the bunker for protection. It’s not that I have a death wish; it’s just that I feel it doesn’t matter where you are – if it’s your turn to go, then … and hey I like my sleep. Depending on where you are located you can go years without having to deal with attacks. I was on a base in Iraq that took 1200 rounds in a 30 day period, we were getting hit so much and so often that we had to wear vests and helmets any time we were outside of a hard structure building. At least 100 people quit that month. I have always been an adventurous person and a bit of an adrenaline junky, on top of that I’m single with no children so the environment doesn’t bother me like it does some, I certainly don’t blame people for leaving when things get hot. The food on base is pretty bland, all the food is convoyed in frozen, and fresh vegetables are limited, I DREAM of good food and wine. The military is housed separately but we all eat together and share the same facilities. All military personnel are required to carry a weapon at all times so you have to be careful not to trip over rifles in the cafeteria. My consolation for the mundane, repetitious and often violent work life I endure, is the 135 days leave I get a year to visit family and travel. I caught the travel bug late in life (30s) but I have been on the move ever since. Travel and photography are my two passions. Most of the places I travel to offer me unlimited opportunities for photography. In 2004 I quit my job in the states and spent the next two years travelling around the world photographing anything that caught my attention, I have since travelled over 48 countries. I like to take the road less travelled but never underestimate popular places; you just have to get more creative with them. For example, I visited the Taj Mahal, probably the most photographed building in the world, and I wanted to photograph it in a way that no one else had. 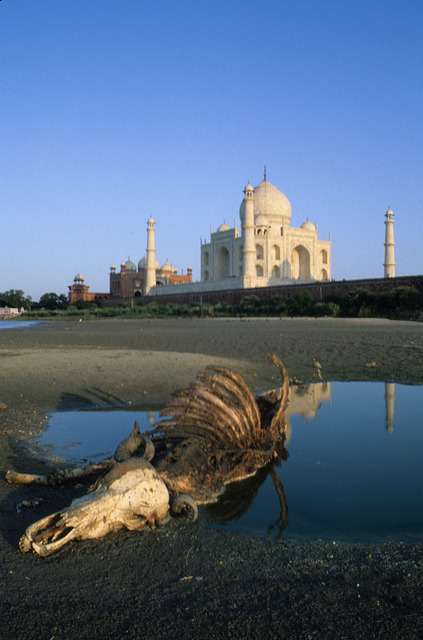 I think I managed to do that in this shot featuring a rotting carcass in the foreground and the Taj behind it, kind of emphasizing the two worlds of India, beauty and decay. In my travels I’m always amazed at the generosity of strangers and the invitations I receive to visit homes. In America we tend to fill our homes with ‘things’ we have collected over the years, yet most homes I have visited whilst travelling belong to people that struggle to make ends meet and tend to be strictly utilitarian. When feeding your family is your priority, decorating your house is not. Family and extended family often live in the same home and often that home is only a couple of rooms or even a single room. Sleeping mats (no beds) are unrolled in the evening and everyone will sleep on the floor. Forget about heat or air conditioning, most times there is only a single low watt light bulb hanging from the ceiling and unpainted walls and concrete or dirt floors are common. One day in Delhi, India, I was walking along the railroad tracks near some shanties that were nothing more than a tarp spread between some bushes with walls of cardboard and scrap material. I began talking to some locals living in the area and was invited to sit down on a blanket in one of the simple dwellings. The man who invited me handed something to a young boy who ran off only to return a short time later with some bananas he had purchased and offered them to me. It’s humbling when someone that has so little shows such hospitality to a complete stranger.